DETROIT - July 25, 2018: We at General Motors offer our condolences to Sergio Marchionne’s family and friends. Sergio created a remarkable legacy in the automotive industry. Our thoughts are also with our industry colleagues at Fiat Chrysler as they deal with this sudden loss. 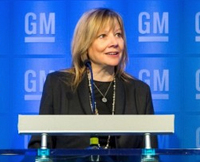 – Mary Barra, Chairman and CEO of General Motors. Sergio Marchionne (June 17, 1952 – July 25, 2018) was an Italian-Canadian businessman who was the chairman of CNH Industrial, the chief executive officer (CEO) of Fiat Chrysler Automobiles, the chairman and CEO of FCA US LLC, the chairman and CEO of Ferrari, and the chairman of Maserati. He was the chairman of Swiss-based SGS and vice chairman of UBS from 2008 to 2010, as well as the chairman of the European Automobile Manufacturers Association for 2012 (first elected in January 2006). He was a member of the Peterson Institute for International Economics, and the chairman of the Italian branch of the Council for the United States and Italy. Noted for his keen observations of the automotive industry, Marchionne's insights ranged from frank criticism of his company's own products to a highly-regarded 2015 presentation titled Confessions of a Capital Junkie, extolling the benefits of industry consolidation. Marchionne was widely recognized for turning around Fiat Group to become one of the fastest growing companies in the auto industry, in less than two years. In 2009, he was instrumental in Fiat Group forming a strategic alliance with the ailing US automaker Chrysler, with the support of the U.S. and Canadian governments and trade unions. Less than two years later, following its emergence from Chapter 11, Chrysler returned to profitability, repaying all government loans. In 2014, Fiat and Chrysler merged into a new holding company, Fiat Chrysler Automobiles, now the seventh-largest automobile manufacturer in the world. Following complications from surgery, Marchionne resigned from all of his positions in July 2018 and died a few days later. The American business channel CNBC described Marchionne as a "legend of automotive industry", while the British newspaper Financial Times considered him as having been "one of the boldest business leaders of his generation". Early life Marchionne was born in Chieti, Abruzzo, Italy, the son of Concezio Marchionne, from Cugnoli (Abruzzo), and Maria Zuccon from Carnizza (today Krnica, Croatia) near Labin in Istria. His father served as a Carabiniere in Istria, where he met his future wife. Marchionne's grandfather, Giacomo Zuccon, a member of the fascistic police was killed in September 1943 by Yugoslav Partisans near Barban in Istria, while his uncle Giuseppe Zuccon was killed by the Nazis the same year. In 1945, when the region was given to Croatia by the Yugoslav army. Then Marchionne's parents moved to Chieti in Abruzzo, where Sergio was born. At age 13, Marchionne emigrated with his family to Toronto, Ontario, Canada, where they had relatives. As a result, he had dual Canadian and Italian citizenship and spoke fluent English, French and Italian. He was a Canadian certified general accountant (FCGA), barrister, and a fellow of the Certified General Accountants of Ontario. Marchionne attended St. Michael's College School, before moving on to complete his undergraduate studies in philosophy at the University of Toronto and then earning a bachelor of commerce degree in 1979, and an MBA in 1985, both from the University of Windsor, and a law degree from Osgoode Hall Law School of York University in 1983. Marchionne received an honorary doctorate from Walsh College in 2013. Sergio Marchionne in 2006 From 1983 to 1985, he worked as an accountant and tax specialist for Deloitte & Touche in Canada. From 1985 to 1988, he was Group Controller and then Director of Corporate Development at the Lawson Mardon Group in Toronto. In 1989, he moved to Glenex Industries where he worked for two years as Executive Vice President. From 1990 to 1992, he was Vice President of Finance and Chief Financial Officer at Acklands Ltd. Between 1992 and 1994, he served as Vice President of Legal and Corporate Development and Chief Financial Officer of the Lawson Group, which was acquired by Alusuisse Lonza (Algroup) in 1994. From 1994 to 2000, he worked at Algroup (Alusuisse Lonza Group Limited) based in Zurich, where he became Chief Executive Officer in 1997. He then took the helm of the Lonza Group in Basel, after its spin-off from Algroup, serving first as Chief Executive Officer and Managing Director (2000–2001) and then as Chairman (2002). In February 2002, he became Chief Executive Officer and Managing Director of SGS S.A. of Geneva where, in March 2006, he was appointed Chairman. Marchionne was elected as an independent member of the Board of Directors of Fiat S.p.A. in May 2003, until being appointed CEO in 2004. Chrysler Group CEO Sergio Marchionne (left-right), Congressman Hansen Clarke (MI-13), Plant Manager Pat Walsh, Secretary Tim Geithner, and UAW President Bob King on a tour of Jefferson North Assembly Plant (JNAP) in Detroit, on April 2011 In June 2009, when Chrysler emerged from Chapter 11 bankruptcy protection, Fiat Group received a 20% stake in Chrysler Group LLC and Marchionne was appointed CEO, replacing existing CEO Robert Nardelli. In February 2011 Marchionne sparked widespread controversy in the U.S. when he remarked at the J.D. Power & Associates International Automotive Roundtable that Chrysler's bail-out loans from the U.S. government carried "shyster rates". Expressing his discontent with the very high interest rates Chrysler had been obliged to pay, he also drew criticism from several quarters for use of the Yiddish term "shyster" which was felt to have an anti-Semitic undertone. Marchionne immediately issued a public apology, stating "I regret the remark and consider it inappropriate" and going on to explain that "As the only parties willing to underwrite the risk associated with Chrysler’s recovery plan, the two governments [U.S. and Canadian] levied interest rates that, although appropriate at the time, are above current market conditions." In July 2011, following the purchase of the ownership interests held by Canada and the US Treasury, Fiat’s stake in Chrysler increased to 53.5% and in September 2011, Marchionne was also elected Chairman of Chrysler. 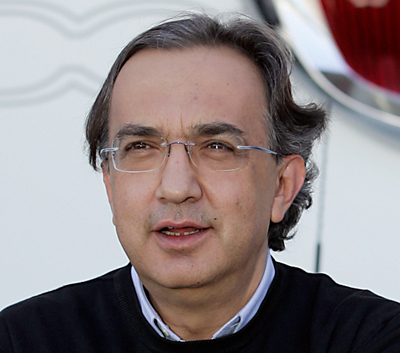 Fiat and Chrysler officially merged under Marchionne's leadership on August 1, 2014.